EXETER – Exeter lost one of its most influential members of the community on July 2: Dale Sally Jr. A year after suffering a stroke, and after a recent successful heart bypass surgery, it seemed like things were heading in an upward direction for the 73-year-old Exeter stalwart. Unfortunately, Dale’s family announced early last week that he had suddenly passed away. Now the community is welcome to pay their respects as a celebration of life will be held at 11 a.m. on July 13 at Exeter United Methodist Church, 148 N. D St. Per a published Exeter City Council agenda, the City will close D Street between palm and Walnut from 10 a.m. to 2 p.m. to accommodate parking. Dale has been a fixture in the community of Exeter for 40 years, and in 2013 he was recognized as such by being honored with the Exeter Chamber of Commerce’s 2012 Heritage Award. In all Dale has been the touchstone for traditional Exeter events like Brewfest, Lions Club’s Fourth of July celebration, downtown New Year’s Eve celebrations and served on the Boy Scouts Board of Directors at the time they raised the funds to build the Miller-Dofflemeyer building on North E Street to replace the old Scout Shack. Despite the long roots he laid down through planting himself in community service, Dale’s legacy began in the 1960s, ’70s and ’80s. Through three decades he helped his father expand their Emperor and Thompson grape operation into labor contracting and land management. 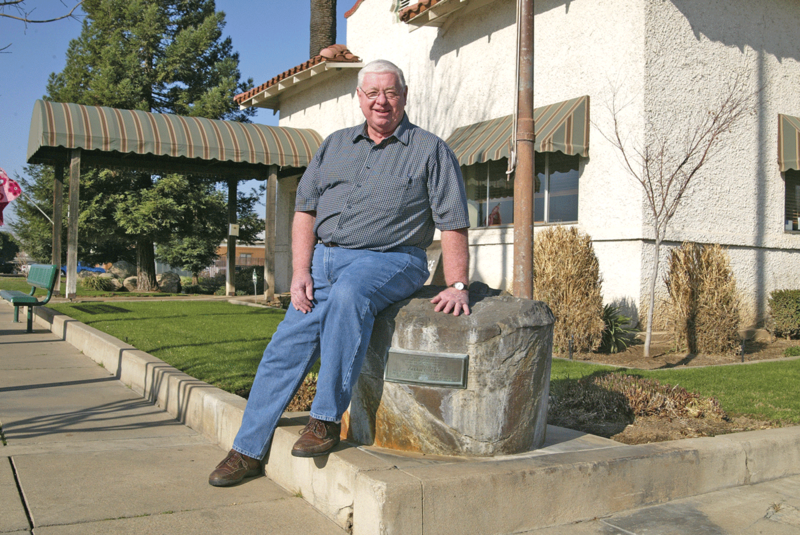 Then in 1997, after serving as Exeter’s representative to the Friant Water Users Authority, he was asked to become the manager for Exeter Irrigation District. Subsequently, Dale’s knowledge on water was unparalleled. Current mayor Teresa Boyce said Dale was the Council’s go-to guy on everything water. Dale served as manager of Exeter Irrigation District for 15 years, nine of which he also served as manager of Ivanhoe Irrigation District, until he retired in 2011. Before his retirement, Sally applied for a vacant position on the Exeter Planning Commission. He served there for 18 months before applying for a vacancy on the Exeter City Council. After being appointed in January 2011, Sally served out the final year of Leon Ooley’s term before being elected in November 2012. Dale’s chops for government had been harnessed over multiple decades serving on multiple boards. During the 1980s, Dale served on the Exeter District Ambulance Board. It was a trying time for the special tax district, which nearly closed if not for a fundraising effort by the community. Dale also served on the board of directors for the Exeter Irrigation District for 12 years. And his position as Exeter’s representative to the Friant Water users Authority gave him the chance to oversee the maintenance and operation of the Friant-Kern Canal. But as he had with all of his other board positions Dale left his mark on Exeter’s city council. Boyce remembers Dale most for his thoroughly inquisitive mind on the dais. “He would ask a question and I would think: Dang it! Why didn’t I think of that?” Boyce joked. For relatively new councilmember Jeremy Petty, who was elected in 2016, the same time Dale was re-elected, he said he’ll miss Dale’s mentor like presence. “I’d say I looked up to Dale. He was the type of councilman that was always the guy to go to,” Petty said. While he was serving as councilman but after his retirement in 2011, Dale and his wife of 51 years Barbara loved traveling to see family. Of which he is survived by daughters Kim, Debbie, and son Will and his sisters Wanda Twibell and Lourana Bolland as well as his several nieces and nephews. The family requests that In lieu of flowers, please make donations to Exeter United Methodist Church or Exeter Relay for Life relayforlife.org/exeterca.